Fashion’s Night Out was even more exciting and exhilarating than I expected. My only complaint is that it should have a whole week! It was IMPOSSIBLE to hit every event I wanted to in one night…and in 3-inch heels! I must say though, my friends and I made the most of the night. Let me start at the beginning. After getting Minxed, I returned to the office for a run-through for our still life shoot the next day. Disaster ensued. Our boss wanted all new clothing samples and I literally had hours to get them all in. Fashion’s Night Out was looking less and less likely but…when there’s a will, there’s a way. While Rachel Roy tweeted about the shaggy fur vest that was flying off the shelves of her pop-up store (follow her at @rachel_roy), I packed, did inventory and sent sample requests in under 15 minutes. I slipped on my military jacket, Dereon black booties and leopard print clutch and hit the road. Here’s my friends, Patrice, Sandrine (who has an amazing art, fashion and lifestyle blog you have to check out!) and I hitting the road for Fashion’s Night Out! We hopped in a cab downtown to the Billionaire Boy’s Club flagship store in Soho. First of all, Fashion’s Night Out in Soho felt like Halloween night for the fashion set. Everyone was dressed up and out on the town. There could have easily been a party outside – people were everywhere traipsing through the streets in heels and shades. The line in front of BBC in particular wrapped around the corner as “Faux-Rells” (our term for Pharrell wannabe’s) littered the streets decked out in head-to-toe in BBC gear. One girl from Arkansas had been waiting on line for four hours to get a glimpse of Pharrell. Inside, lucky shoppers enjoyed hors d’oeuvres and cupcakes, and chatted with the N.E.R.D. frontman as he worked the register. Kid Cudi made a guest appearance to the delight of the crowd that spilled onto the Soho streets and hung out with his fellow artist friend once inside the shop. Very cool! Pharrell headed to Billionaire Boy’s Club. We made it through the Kid Cudi fan crowd out alive and sauntered over to the Rachel Rachel Roy pop-up store to check out the collection. If you are a true Glamazon fan, you know I am in love—wait, obsessed—with Rachel Roy’s new collection for Macy’s. Seriously. I’ve been talking about the pop-up store since the preview in May. My favorites from the collection, like the watercolor dress I adore, were all on sale for unbelievable prices. Even cooler? She hosted a twitter contest for a free pair of peace earrings. The first ten people who showed her tweet about the earrings won a pair! So glam! While guests waited for the ladies of the hour, Rachel Roy and host, Estelle, we were treated to Good Humor ice cream outside the shop (did I mention my two favorite loves are dessert and fashion?). 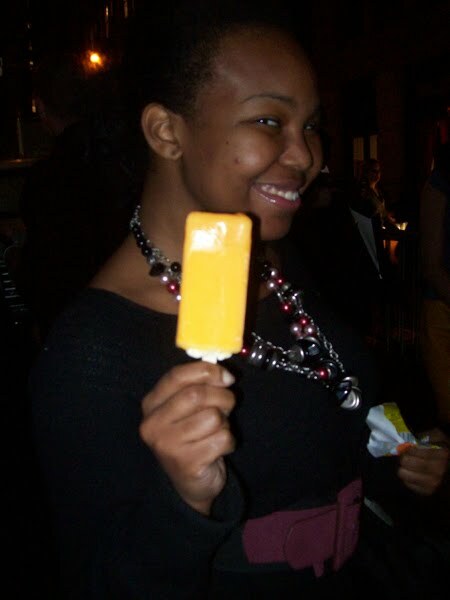 My friend Patrice loving her free ice cream! Once they arrived, looking beautiful of course, they chatted it up with shoppers and fans then just lounged and took in the scene. Here’s a picture they tweeted from Rachel Roy’s account (twitter.com/rachel_roy). I personally love the two of them together and cannot wait for their upcoming jewelry line! Just as we were preparing to head out, in walks Iman looking statuesque and flawless. Everyone in the store went crazy as no one was expecting a guest appearance from the famed model/mogul, who was as gracious and sweet as ever! We had a wonderful time hanging out with them, but there was so much more to see! We hit the Soho streets again only to run into a mob of fans chasing Vogue Editor-in-Chief and September Issue star, Anna Wintour down the street. I’ve never seen an impeccably-dressed fashion editor run so fast in my life. I’m sure after she got to safety, though, she was pleased with the great success of Fashion’s Night Out in NYC and all over the world (I heard London gave us a run for our money!). Congratulations, Queen Anna! Congratulations. Inside Intermix, the diva of all divas was spotted hitting the dance floor. Yes, ladies and gentlemen, Rihanna, was partying inside the store in a hooded black dress, gloves, a spiky bracelet and these uber-cool studded sunglasses. Of course, she added a fierce red lip. Does it get any hotter than that? I don’t think so! Once outside, we decided to hit up the Rocawear 25th Anniversary party uptown and as we went to hail a cab, we caught a glimpse of stylist to the stars, June Ambrose, modeling in the storefront window of Alexander McQueen! It was hilarious!! At last, the final party of the night. We hit Rocawear’s 10th Anniversary party to celebrate the great success of the brand and rub shoulders with our fellow industry fashionistas and fashionistos. We ended the night partying to tunes from Jay-Z’s new album Blueprint 3 (LOVE Empire State of Mind with Alicia Keys) and shooting the breeze with Fashion’s elite. And as I’m rapping at the top of my lungs, who walks by? None other than Jay-Z dressed head-to-toe in black and wearing signature stunner shades. We even spotted Beyonce on the scene supporting her hubby! Unbelievable. Wow. I had no idea when I blogged earlier about Fashion’s Night Out, that I’d be shopping and partying with some of the hottest stars in the music biz. It was an amazing night and I loved every minute of it – can’t wait until the next one! Glamazons, what was your favorite moment of Fashion’s Night Out? Who was your favorite star sighting? And let me know what great pieces you bought at the events.